Anna was very helpful in her online booking of my bus to Kiev. There were some complications with my bus station location departure point to Kiev, as I arrived from Bucharest on a bus arriving at the Odessa train station, but the Kiev departure bus station was way across town at the Central bus station complicating the trip and Anna booked me with the Odessa train station very near the hostel, as I thought was the departure point I had booked. Felt like a home away from home. The room was very clean, very comfortable and had a low key social atmosphere. Would definitely recommend! Friendly, quiet and very modern facilities. Dorm is very spacious. Wifi wasn't working the day I was there, staff was very apologetic but I would consider no wifi as an urgent problem to resolve, travelers really need it. 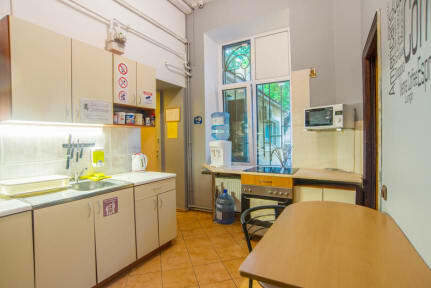 The hostel is very well located, just nearby the main railroad station, in addition, from the place it's easy to get both to the city center and to the beach. The kitchen is quite well equipped, though no salt, oil and such free stuff are available. An atmospheric private courtyard with a bench for a quiet and cozy evening coffee-break is available. When we came, there was some kind of wi-fi blackout, so, unfortunately, there was no wi-fi when we came. Good value for the money! 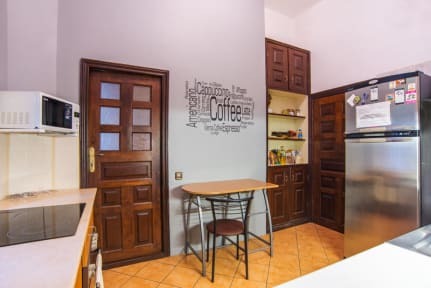 Great location near the train station and close to public transport and shops. Staff didn’t speak too much english, but were very nice and did everything they could to help. Rooms were comfy and well equipped, kitchen and bathrooms were always clean and had everything they needed. Plus there was a nice backyard and a cute cat :) Would stay there again! This hostel is like staying in a strangers house. There are very few travelers there. Most of the guests are locals staying there long time. There are no lockers in the rooms and only a small locker in the lobby. Not very friendly for foreigners. There was one receptionist who tried to speak English but the other two I saw did not. No atmosphere, mainly locals staying here. Be aware that this is not a backpacker hostel. The time I stayed there the hostel was full with Ukrainian people (mostly man above 40) and students that stayed there for weeks. So dont expect to get in contact much. Beside that the hostel has the most comfortable beds in the Ukraine I stayed at. Advertised prices are a s**m staff demand a much higher rate upon arrival. Not the best location and rooms are cold.